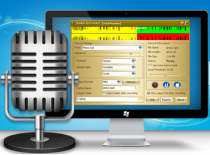 Audio Recorder for Windows - Record sound, voice, music or other audio streaming in real time. What You Hear is What You Get! True lossless recording quality! It is designed to record complete audio streaming from any sound sources like microphone, Stereo Mixer, streaming audio from the Internet, external input devices (such as CDs, TV, LP player, cassette tape player, digital phone calls) as well as other applications like iTunes, DVD Player, Real Player, Windows Media Player, Skype, ICQ, Chrome, IE, FireFox and many more. It can be used to grab any digital audio, including game sounds, online music, movies, podcasts, streaming audio or anything else. Sometimes it is the only way to turn DRM-protected M4P, M4B, WMA music, or iTunes music to common audio files. The recorded audio can be saved directly to MP3, WMA, AAC, WAV, OGG, MP4, M4A format, without any temporary files. and preserving 100% of the original audio quality. It's simple to use yet powerful enough to produce high-quality sounds, all you have to do to is press the red circle (Record) button to get started! Record audio from sound card directly to MP3, M4A, WMA, AAC, WAV, OGG, MP4 format. Easily record digital phone calls from programs like Skype. Record audio from any online video or audio stream with 1:1 quality. Full control over sample rate, channel, audio codec, bits per sample and bitrate. Support recording audio from any sources including the microphone, CD Audio, MIDI, line-in, or applications. Affordable Pricing - Just $14.95 you will get all these incredible features. Real-time sound visualization enables you to adjust your audio source and make high quality recordings. Record Volume Control Support: Audio Recorder integrates the complete set of record volume control for your convenience. Flexible Setting: Support Configuring Parameters of different audio formats. Direct-To-Disk Long Time Recording Support: Audio Recorder allowing you to keep recording for as long as there is free disk space. OS: Windows 7 Audio Recorder, Full compatible with Windows 7, 8, 10, Vista, 2003, XP. Copyright © 2002-2019 www.Sound-Recorder.com. All rights reserved.